Prepare the marinade by gently boiling the first 6 ingredients in a medium saucepan until reduced and thick, about 20 minutes. Allow to cool completely. Divide into two containers and refrigerate one container for later. 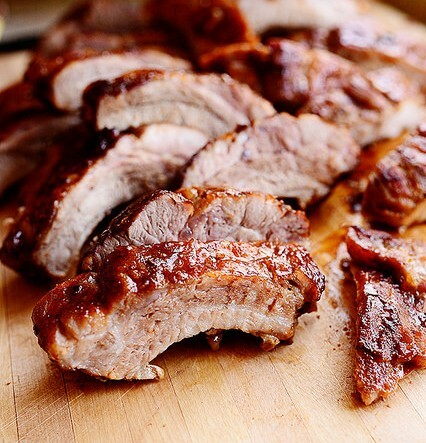 Place ribs on a large baking sheet lined with heavy foil. Brush half the marinade all over the ribs on both sides. Cover with foil and refrigerate for 8 hours to marinate. When you’re ready to cook the ribs, preheat the oven to 275 degrees. Place the pan, still covered in foil, into the oven for 2 hours. Remove the foil and increase the temperature to 300. Using the other half of the sauce, brush another generous layer all over the ribs. Return the pan to the oven and continue cooking for another 30 to 40 minutes, brushing on another layer of sauce as it cooks. Remove the ribs when they’re fork tender (keep cooking until they are). Slice and serve!